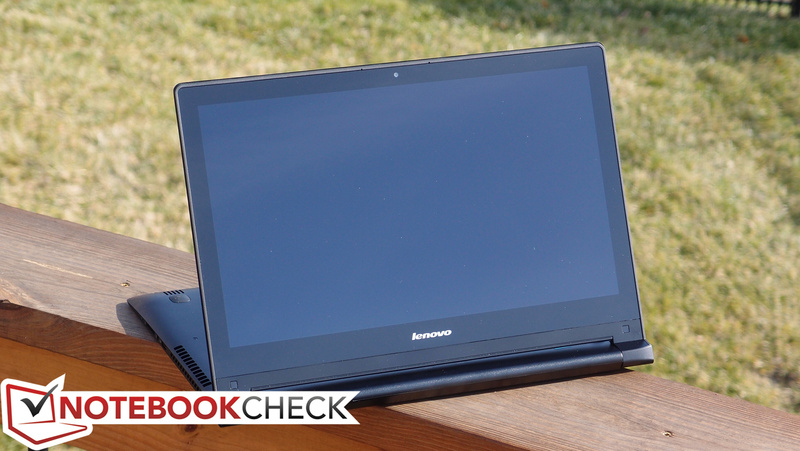 Since popularizing the design with their Yoga years back, it seems like nearly every time we turn around, Lenovo’s introducing yet another transformative notebook permutation. 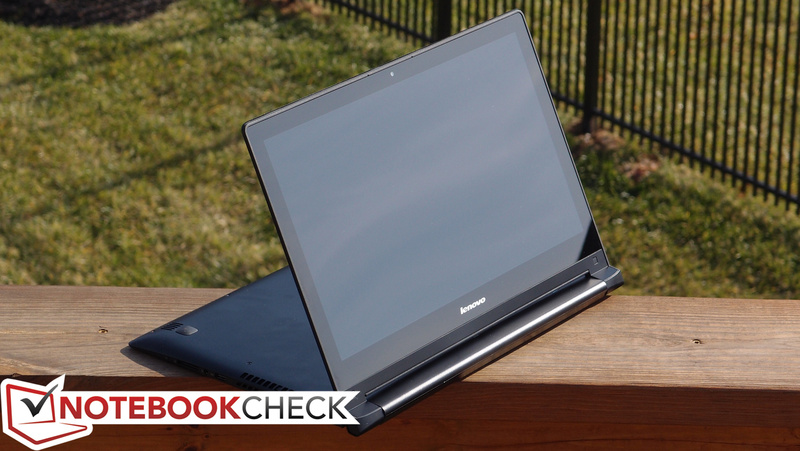 The Lenovo Edge 15 is the latest of these, and you’ll only find it at Best Buy. While the most obvious comparison would be to the now-ubiquitous Yoga line of machines, the Edge 15 actually seems more accurately borne of the defunct IdeaPad Flex models, thanks to some very similar design elements and an only partial incorporation of the Yoga’s transformation capabilities (Laptop and Stand Mode only, specifically). 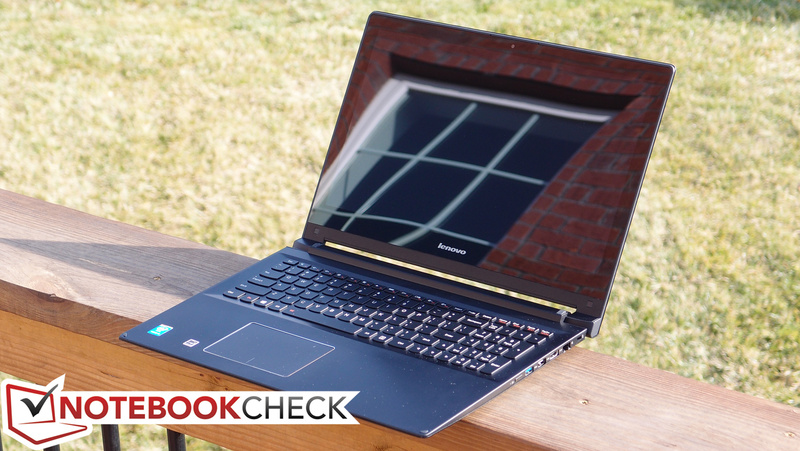 Around a year ago when we reviewed the Lenovo IdeaPad Flex 15, we admittedly weren’t overly impressed with it, citing a poor LCD panel, a weak battery life, and budget construction quality, among other items. Fortunately, the Edge 15 is more than simply a rebranding of the IdeaPad Flex 15; it’s also fundamentally improved in many areas. 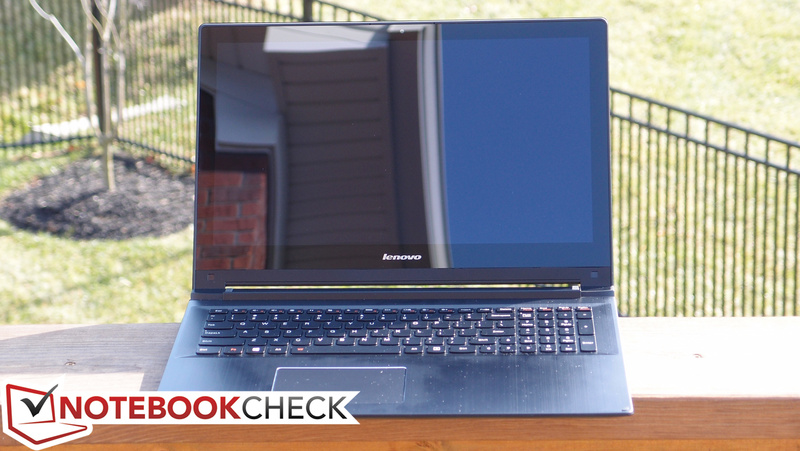 Our review unit is the less expensive of the two options available at Best Buy: for $699 MSRP, you get an Intel Core i5-4210U, 6 GB of DDR3L RAM, and a 1 TB 5400 RPM hard drive—and, of course, a touchscreen. 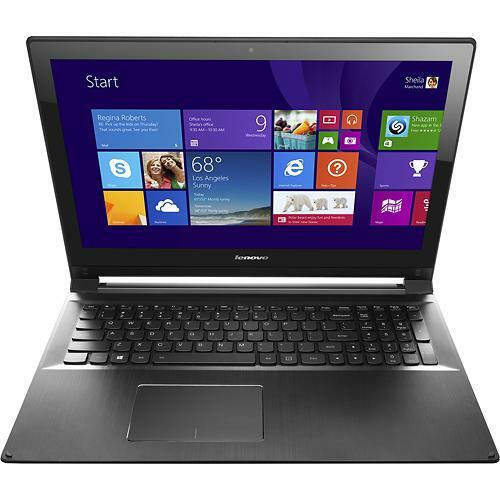 For $200 more ($899 MSRP), Lenovo also offers a Core i7 configuration with 8 GB of RAM and 2 GB NVIDIA GeForce GT 840M dedicated graphics. It’s not a bad price to upgrade to a system that could handle many modern games at modest settings. 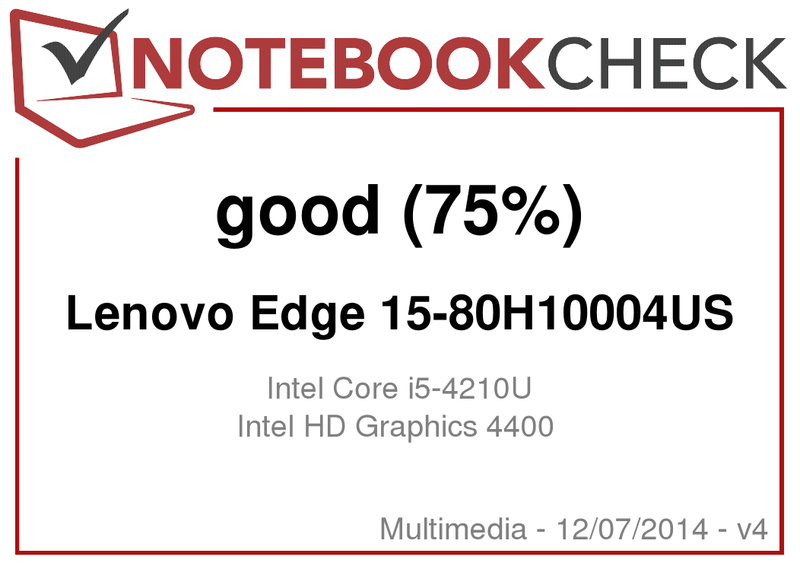 Let’s see how the Edge 15 stands up to our trademark bevy of intensive tests. The display lid is attractive... and attractive of fingerprints, too. 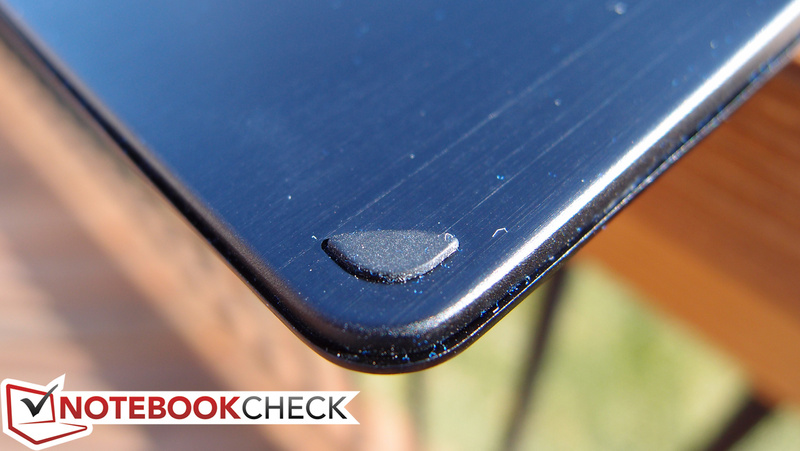 Well-placed rubber pads protect the base while in Stand Mode. The hinges are strong and supportive. 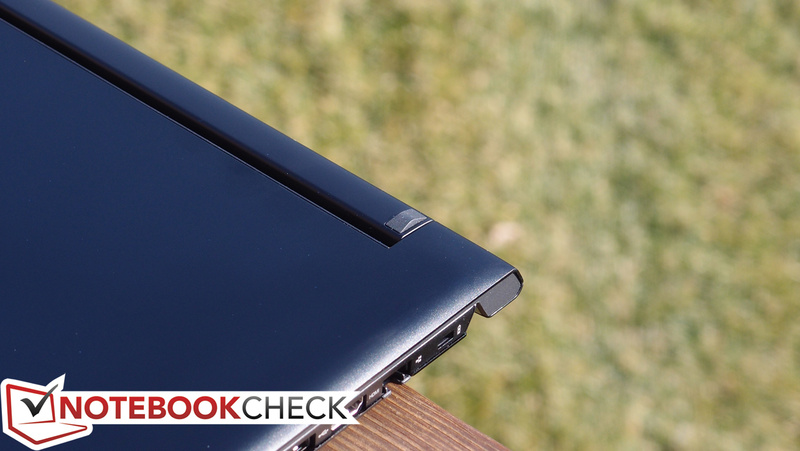 The first thing you’ll notice when comparing an IdeaPad Edge notebook to the new Edge 15 is that the case has been the subject of some gracious reworking. Gone are the cheap plastic frames that stood in such stark contrast to their Yoga superiors; in their place is a sleek, rigid, and expensive-looking brushed aluminum body which is as practical as it is attractive. The base unit suffers only the slightest degree of flex above the keyboard near the middle, with no other structural weaknesses worth mentioning. Even the display lid does a good job of resisting twisting and pressure from behind. While it’s possible to provoke distortions under heavier pressure, it isn’t likely to be any sort of concern in practical use. 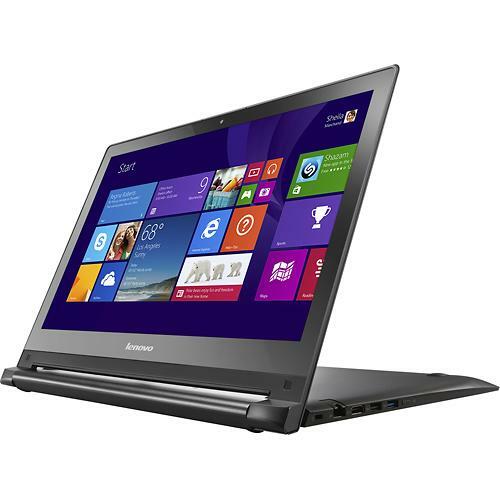 The unit’s hinges are also far improved over their IdeaPad predecessors, the latter of which we complained were bouncy and irritating during typing and while moving around. The Edge 15’s, by contrast, firmly hold the display in place and provide no such fuel for criticism. Most of the rest of the design is quite similar indeed to the Flex models, with rubber pads in place on top and bottom of the base to stabilize and protect the unit during transformation, and a sunken keyboard to evade any stray hazards while positioned in Stand Mode. 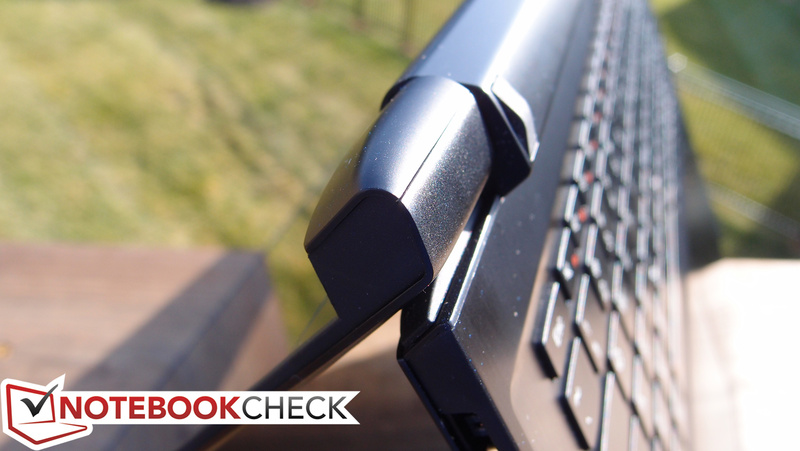 Speaking of which, that’s the only transformation the Edge 15 can undergo: between conventional Laptop Mode and Stand Mode, which sees the machine resting with its keyboard face down against the surface and the screen standing directly upward in front of it, rotated around 190 degrees or so to that point. The haptic quality of the chosen materials is overall very good; the Edge feels as high-end on the lap as it looks. However, you might have guessed that the higher incidence of metal has also increased the machine’s weight: at 2.418 kg, the Edge 15 isn’t overly heavy, but it’s above that of the Flex 15 (2.3 kg), and it does feel rather dense considering its rather compact dimensions for a 15-inch machine. 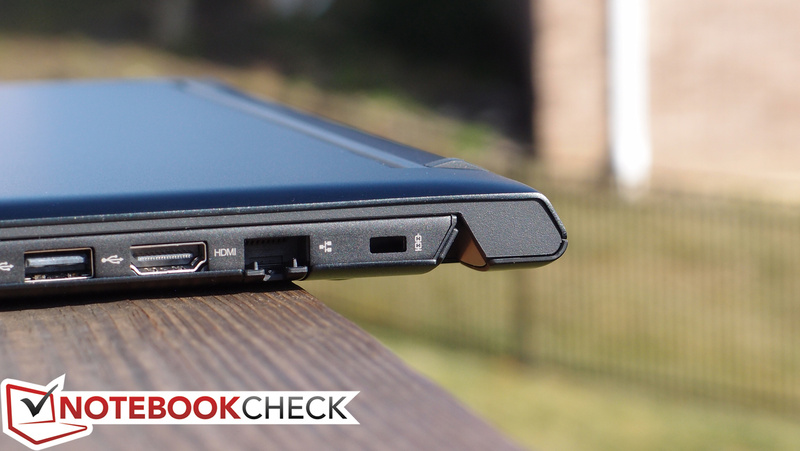 To that end, its thickness of less than an inch (just 23 mm) is pleasantly surprising for a sturdy 15-inch notebook. Lastly, there’s the question of maintenance. Fortunately, the Edge 15 makes it pretty easy: the bottom panel is secured by eleven Phillips-head screws, and underneath it you’ll find access to both RAM slots, the hard drive, the internal battery, the heatsink/fan, the CMOS battery, and the wireless card, among other items such as both speaker assemblies. 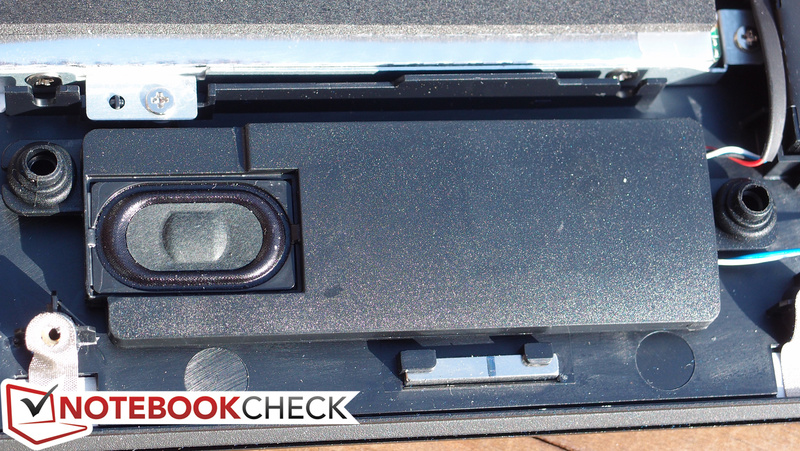 It should be fairly easy to upgrade nearly anything in the system—though it is worth pointing out that, as is the case with all touchscreen models, a screen breakage basically nearly totals the unit. 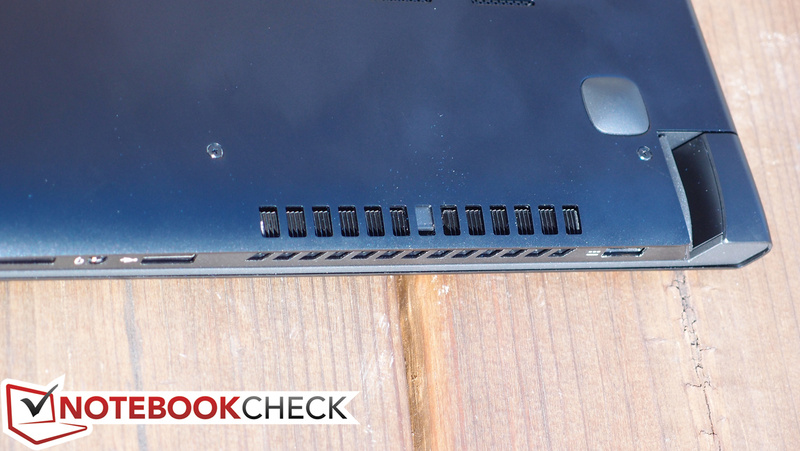 The Edge 15’s port selection is nothing impressive, sporting just three total USB ports—only one of which is USB 3.0—and HDMI only for video output. We would have loved to see a fourth USB port and at least one other USB 3.0 option; most notebooks in this size class manage that. It would have also been convenient to have the option of DisplayPort, but since this is a consumer-grade machine, that omission is more forgivable. At least an SD card reader is included. Port placement is only a minor problem on the right side of the unit, where the two USB ports are in quite close proximity to one another, as well as with the adjacent HDMI port. The latter is actually also very close to the Ethernet port—so this whole area could have been better designed. Nevertheless, the third USB port is alone on the left side, so larger connectors can be relegated to that one if necessary. The Edge 15 packs an Intel Dual Band Wireless-AC 3160 1x1 adapter supporting transfer rates up to 433 Mbps. Some customers have reported connectivity struggles with this adapter, but we experienced no issues in our testing using an ASUS RT-AC68U router apart from some less-than-stellar reception on the 5 GHz band on speckled occasions (as compared to a Dell Latitude E7440 with Intel Dual Band Wireless-AC 7260). The Intel adapter also features integrated Bluetooth 4.0 LE. 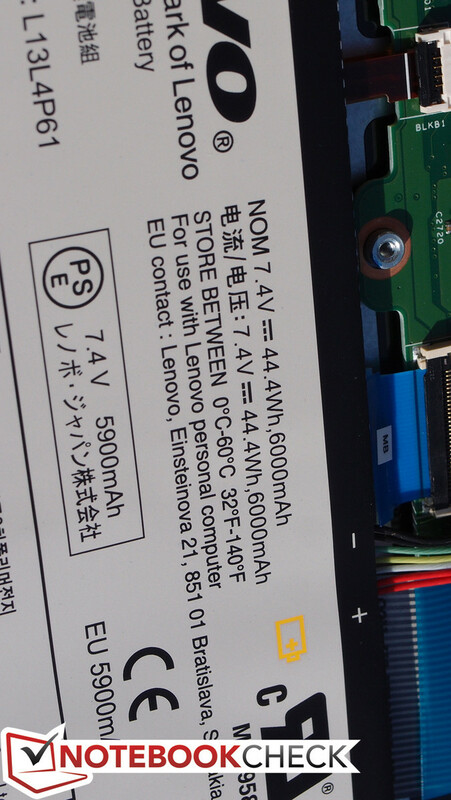 The Lenovo Edge 15’s AC adapter is surprisingly compact given the size and class of the machine, weighing in at just 270 g and easily tucking into a travel bag. Apart from this, nothing else is included. The machine carries a 1 year limited depot warranty. The keyboard is a major disappointment. 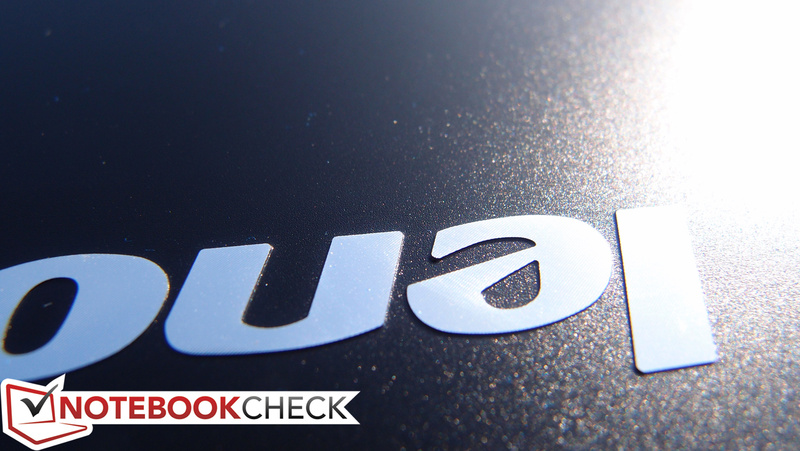 The touchpad isn't bad, but it's nothing special either. 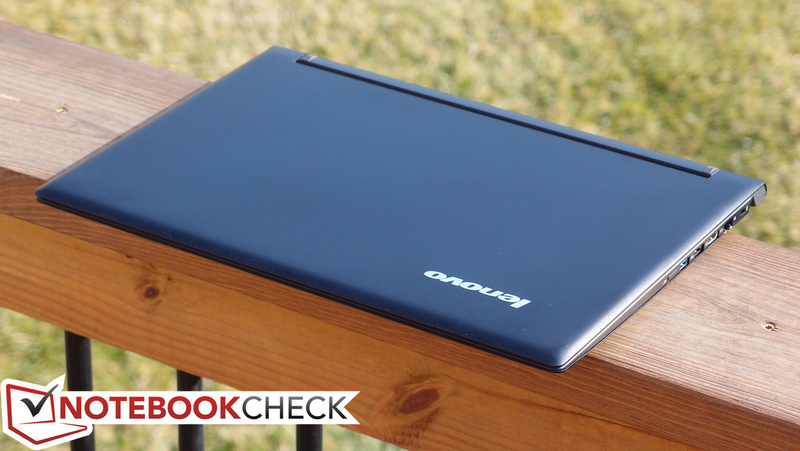 The first major disappointment that the Edge 15 suffers is its keyboard, which is arguably one of the most subpar of any recent Lenovo machine. Key travel is incredibly short for a 15-inch notebook, and feedback is too soft and subtle to provide confidence during quick typing. The layout isn’t unfamiliar or bad, though the crowding of the number pad with the right side of the rest of the keyboard is an occasional challenge. 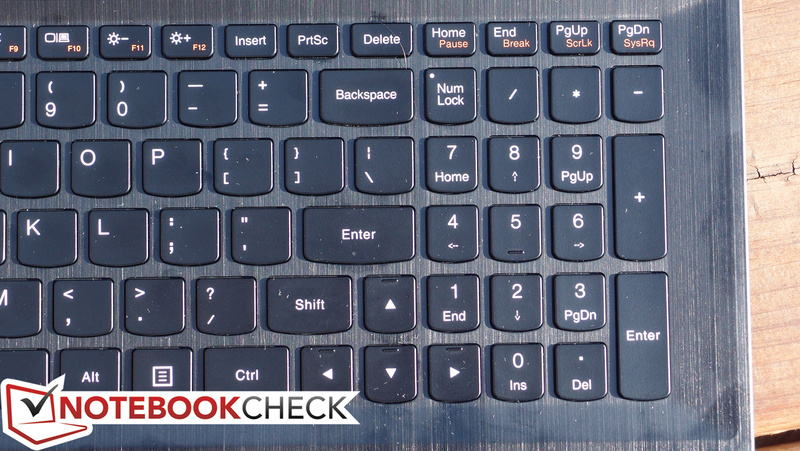 We also found that on our review unit, the Backspace key would stick, which was incredibly frustrating to say the least. This is likely a fluke with our particular unit, but when combined with the aforementioned poor key travel and feedback, it was difficult to tell when it even occurred—which says a lot for the quality of the typing experience on the Edge. 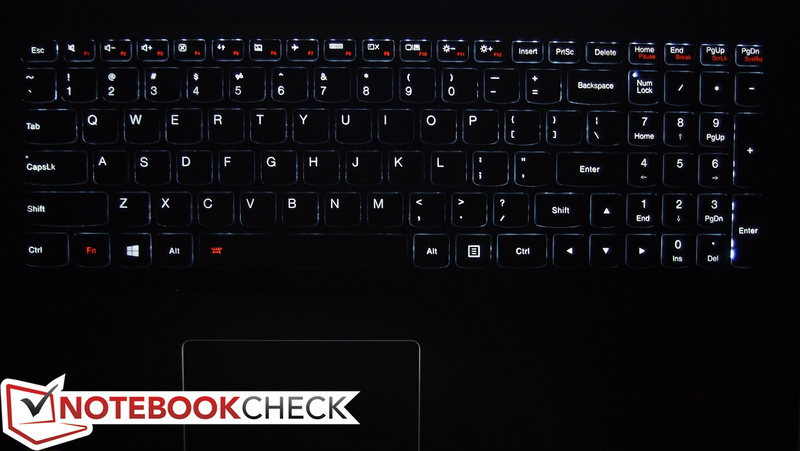 On a more positive note, the keyboard is backlit (three states: off, low, and high). But when it comes to actual usability, it would be difficult to recommend the Edge 15 to anyone who plans on doing any considerable amount of typing without insisting that they spend time trying out the keyboard for themselves beforehand. 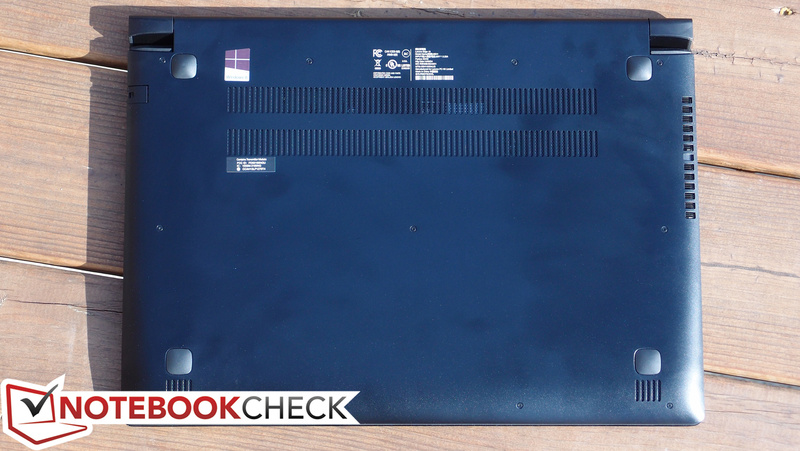 The Synaptics clickpad isn’t great, but it isn’t terrible either—at least, it’s better than that of many modern ThinkPads, where the cursor jumps with each simulated “click”. We experienced no such frustration with the Edge 15’s pad, though the clickpad design of these units is still a far cry from the luxury of a set of physical buttons. Meanwhile, the surface finish and size is comfortable, and gestures were not a problem during our evaluation. 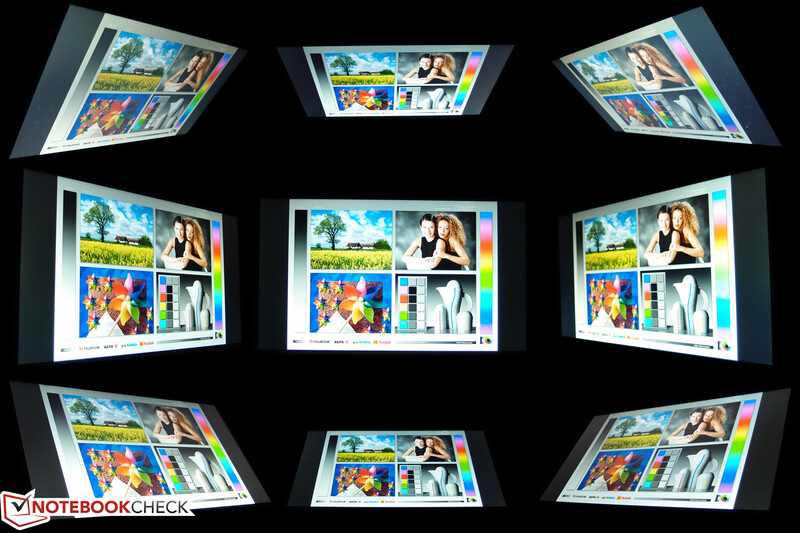 The Edge 15 also features a touchscreen, of course, which is of the usual 10-point multitouch variety. It’s accurate and comfortable to use, though the screen covering is a bit grippier than that of many higher-end Ultrabooks (which often feature Gorilla Glass NBT; the material used on the Edge 15 is not specified). 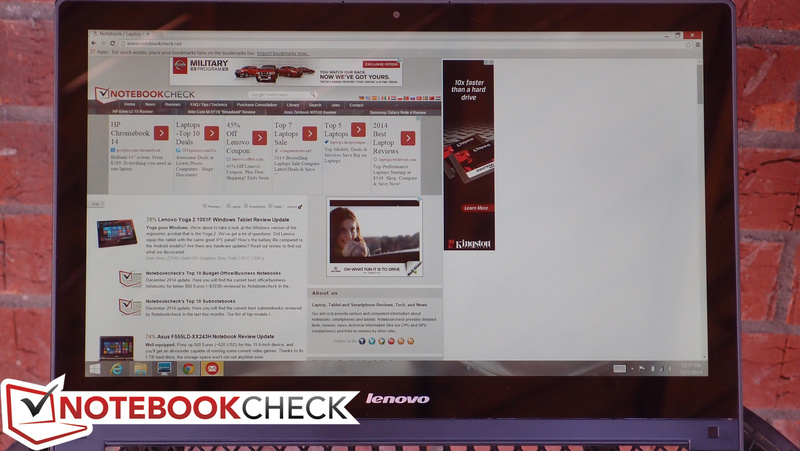 The Lenovo Edge 15 also makes obligatory strides over its Flex 15 ancestor with a 15.6-inch 1920x1080 (1080p) IPS glossy display. That factors out to 141 PPI, which is appropriately dense and not arguably overkill like many of the QHD+ displays we see sucking the battery life out of many modern Ultrabooks. In fact, in spite of its comparably lower resolution, the Edge 15’s panel could actually be preferable to that of the Yoga 3 Pro’s, for instance, thanks to the fact that the Edge 15’s features a conventional pixel arrangement in contrast to the Yoga 3 Pro’s PenTile screen. Having said that, while the resolution is a nice step up from the Flex devices, the color quality and brightness subjectively leave a lot to be desired. Getting down to our measurements, we found an average brightness of 248 cd/m², which is serviceable but hardly impressive. 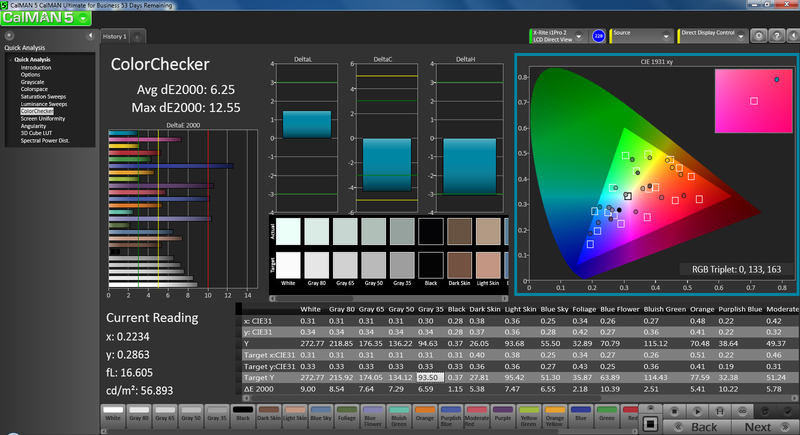 A black value of 0.374 cd/m² yields a rather decent contrast ratio of 729:1, and a brightness distribution of 86% makes for fairly consistent luminosity across the breadth of the panel. 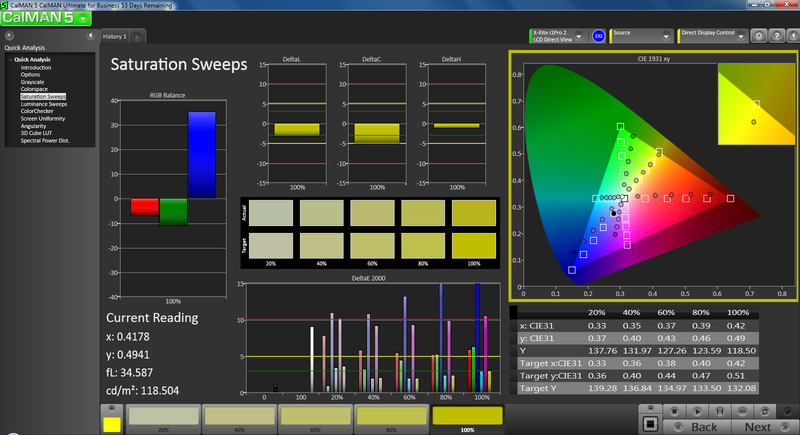 On the other hand, the panel’s sRGB gamut coverage of just 50% isn’t going to please anyone. While most people with any graphic design or professional photo editing obligations are unlikely to be seriously considering the Edge 15 in the first place, this sort of performance is getting down into the territory where everyday users are going to find the deficiency difficult to ignore. 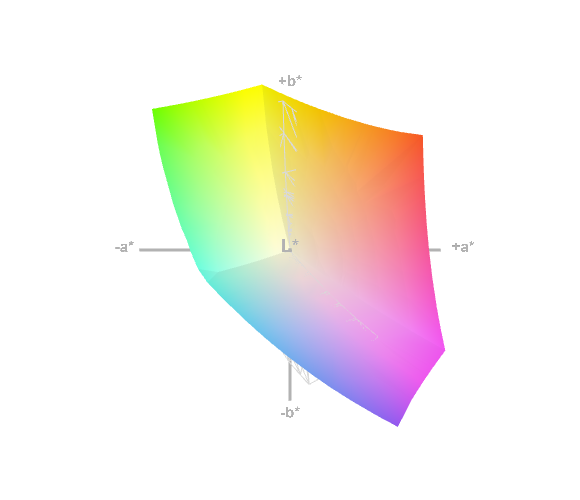 Colors appear flat and lifeless across the board. CalMAN 5 provides a deeper look at the situation. With an average DeltaE of 6.97 and major deviances of values in excess of 10 cd/m² across the bluish and purplish hues, it’s quite clear that this is not one of the Edge 15’s strengths. 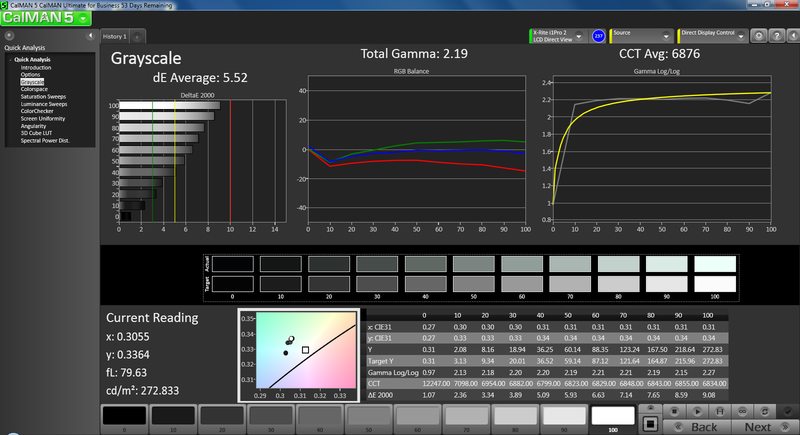 At least the total gamma of 2.21 (ideal: 2.2) and CCT Average of 6811 (ideal: 6500) are good. Outdoors, the Edge 15 struggles mightily thanks to its glossy panel and weak overall brightness. Reflections are a constant struggle, though use in the shade is possible and the situation is helped somewhat by the stable hinges (and thus the lack of bouncing reflections). Viewing angles are excellent as the panel is of the IPS variety. 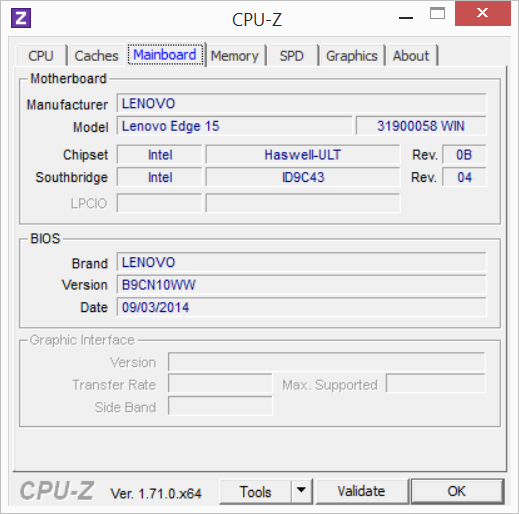 There are only two CPU options currently available on the Edge 15: an Intel Core i5-4210U and an Intel Core i7-4510U. 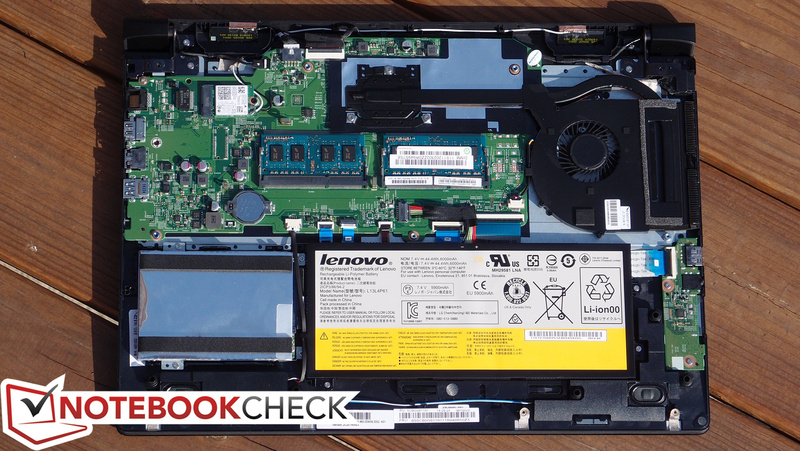 We received the former option in our machine, and while it’s a capable performer, the i7 model actually does provide a substantial premium in our benchmarks—so anyone seeking a bit more horsepower shouldn’t write it off. 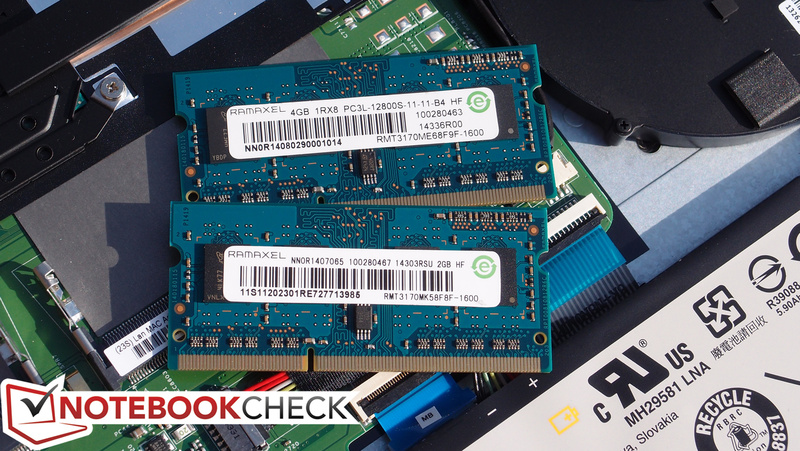 Our Edge 15 also shipped with 6 GB of DDR3L RAM (single-channel; comprised of a 4 GB and 2 GB SODIMM), which is a healthy sum for nearly any typical user, though we regret the lack of dual-channel operation thanks to the mismatched capacities of the sticks. 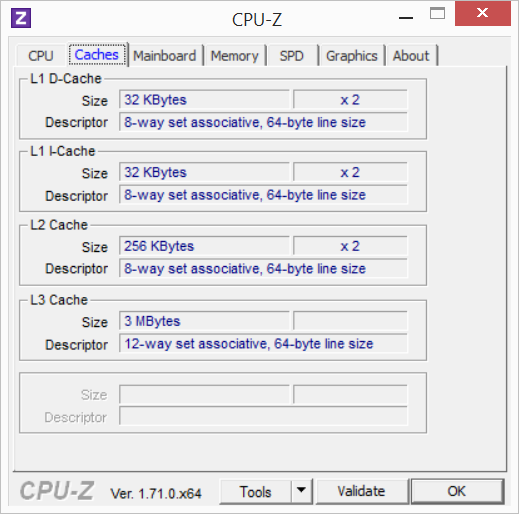 For those interested in better graphical performance with the lower-end Edge 15 configuration, swapping the 2 GB stick for a matching 4 GB part should actually provide a notable increase in GPU performance thanks to the invocation of dual-channel operation. Or, of course, you can always step up to the pricier $899 configuration, which not only buys you the Core i7 CPU, but also includes 8 GB of RAM. 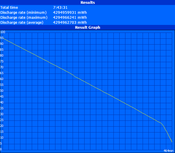 The Edge 15’s performance while unplugged appears to be mostly unchanged from that while operating on AC power; we received a 3DMark 06 score of 4934 on battery, which is within arm’s length of the 5192 we recorded while plugged in (5% difference). 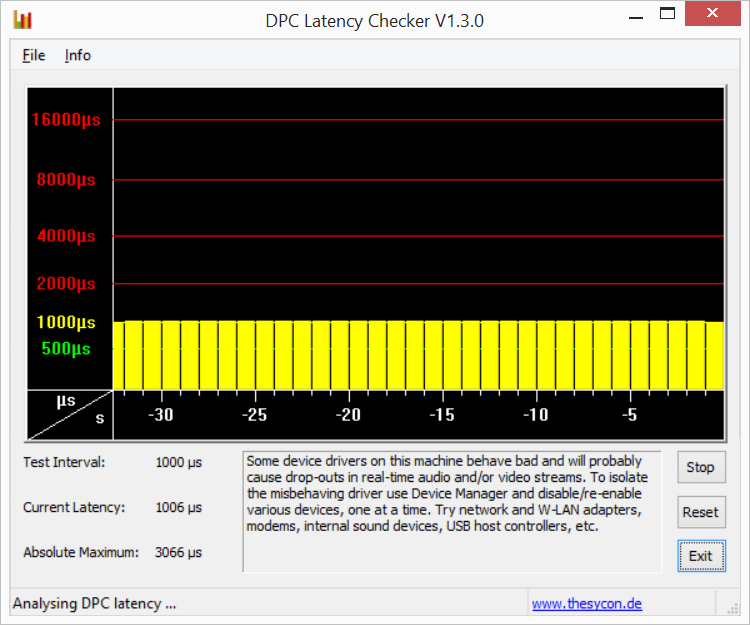 DPC Latencies are also under control, so there should be no trouble streaming real-time audio and video on the Edge. 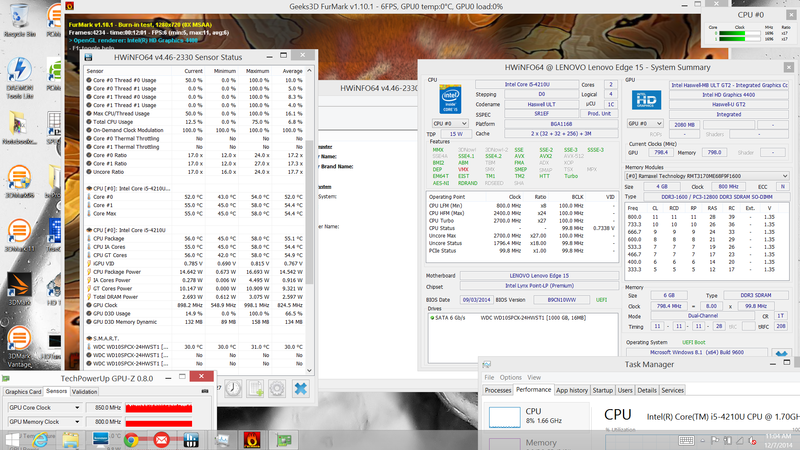 The Intel Core i5-4210U in our Edge 15 review unit is a dual-core CPU based on the Haswell architecture. It features a base clock rate of 1.7 GHz and Turbo Boost speeds of 2.7 GHz and 2.4 GHz for 1 and 2 active cores respectively. 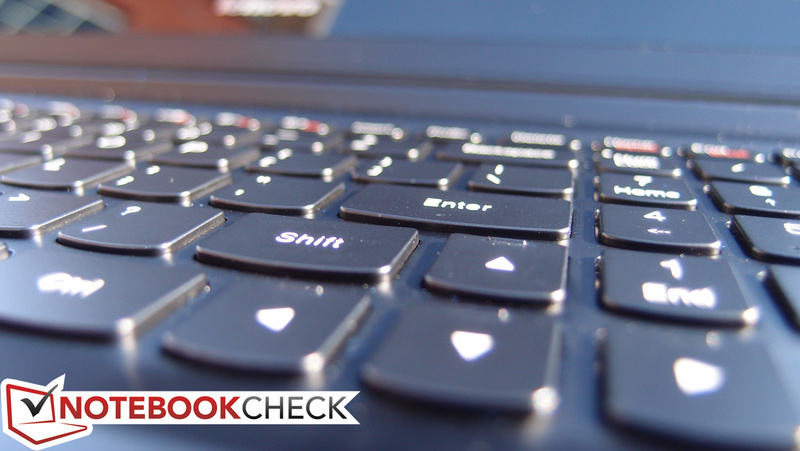 It’s a fairly popular choice among laptops prioritizing portability due to its effective balance of power and efficiency; in our benchmarks, we frequently find it alongside such previously-respected candidates as the Core i5-2410M and the Core i5-3427U. 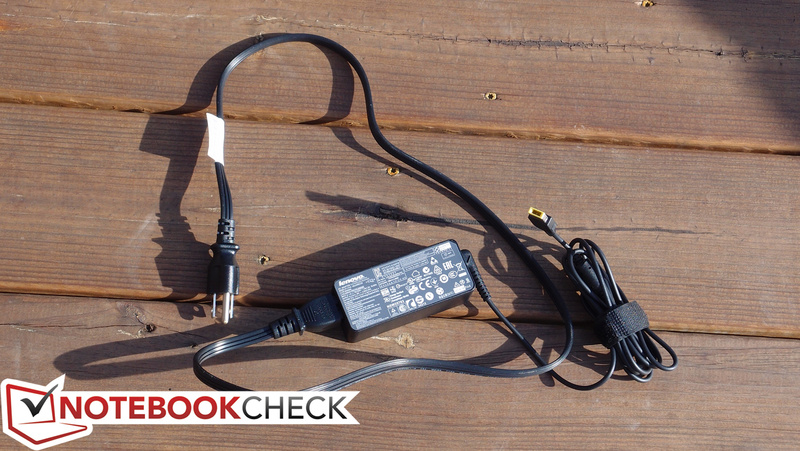 With a TDP of just 15 W, it runs cooler and consumes less battery than its full-voltage counterparts, too. 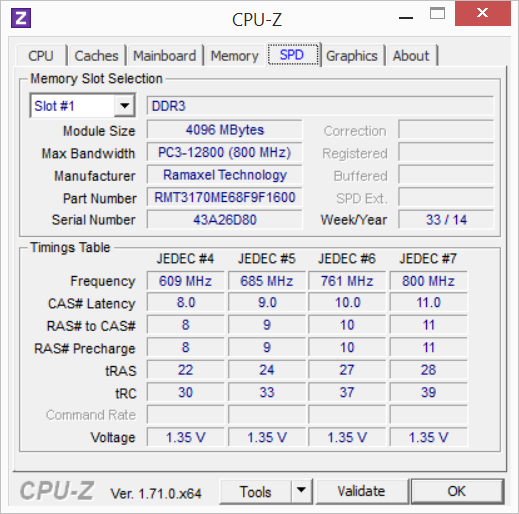 We have extensively tested this CPU already across numerous other models (to see our dedicated page for the Core i5-4210U, click here). But to quickly summarize the Edge 15’s capabilities with relation to its CPU, it’s perhaps slightly below the category average for this chip, with scores of 3069 in 3DMark 06 CPU (vs. average of 3149) and 757 seconds in superPi 32M (vs. average of 732) serving as quick examples. 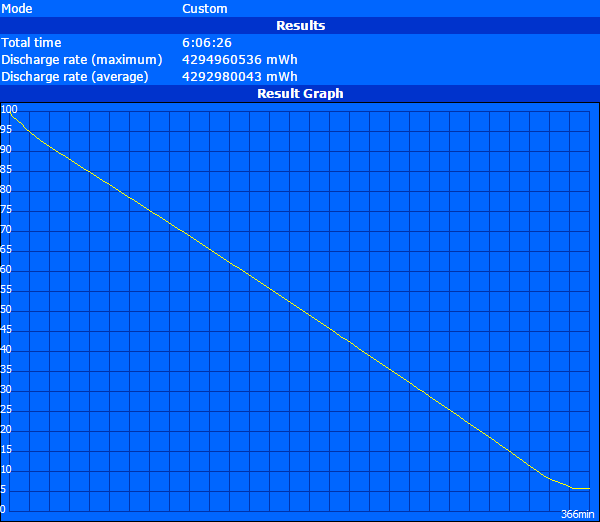 While the Edge’s CPU and RAM might be sufficient for speedy operation, the 1 TB 5400 RPM drive leaves us a bit concerned. Predictably, although it’s among the quicker 5400 RPM drives available, its effects on overall system performance are immediately noticeable. PCMark 7 scores the system just 2648, whereas PCMark 8 V2 Home accelerated yields 2250. 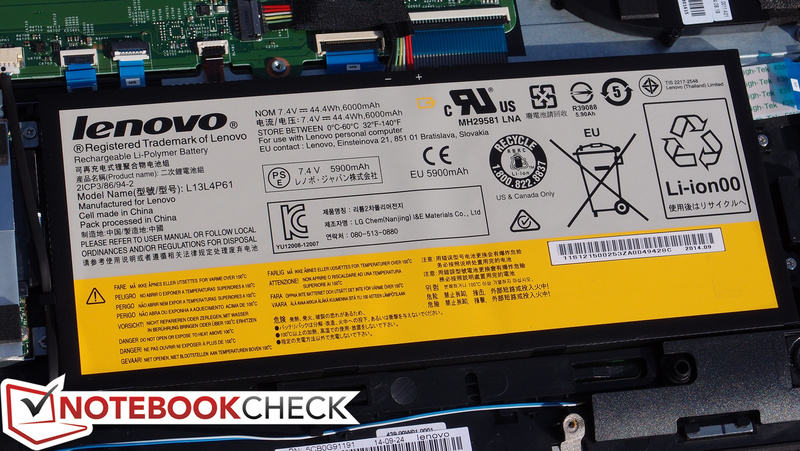 These are not terrible scores for a hard drive-equipped system, but stepping up to a solid-state drive would make a sizable difference without a doubt. Unfortunately, neither of the prebuilt configurations includes one, so the user will need to replace it aftermarket. 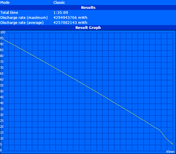 The 5400 RPM drive is quick for its class, but still sluggish in comparison to an SSD. 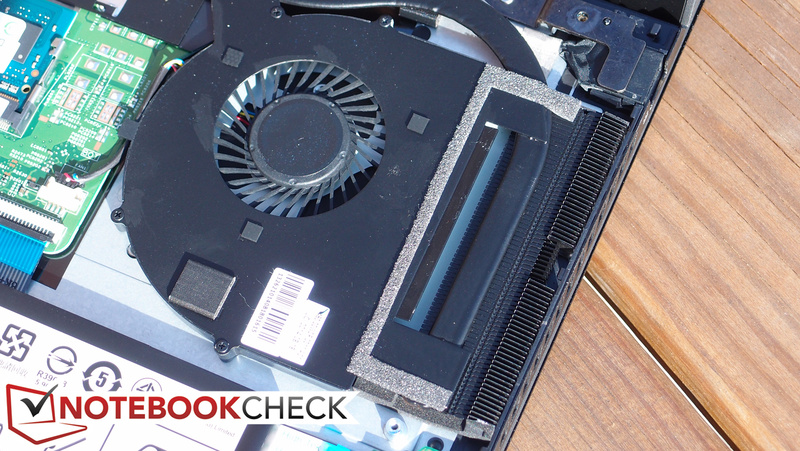 Dropping from the now-abundant SSDs down to the grade of a 5400 RPM conventional hard drive is always a jarring transition—so if you’re already used to solid-state speeds, be prepared for the discrepancy. Having said that, the drive included in our Edge 15 review unit is a respectable model: the WDC WD10SPCX-24HWST1 in particular, which is a fairly quick drive in spite of its low spindle speed. 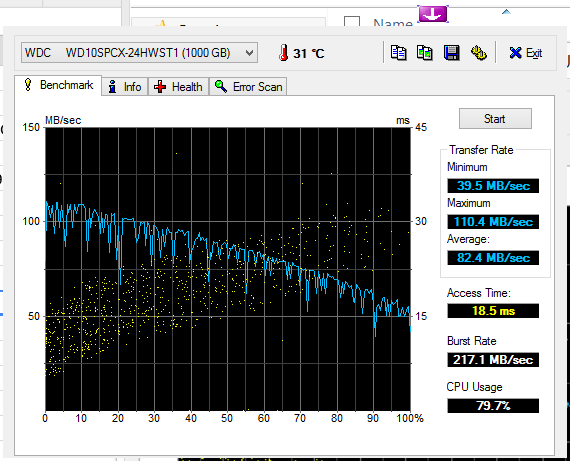 HD Tune reports a Transfer Rate Average of 82.4 MB/s, which is very good for a 5400 RPM drive. 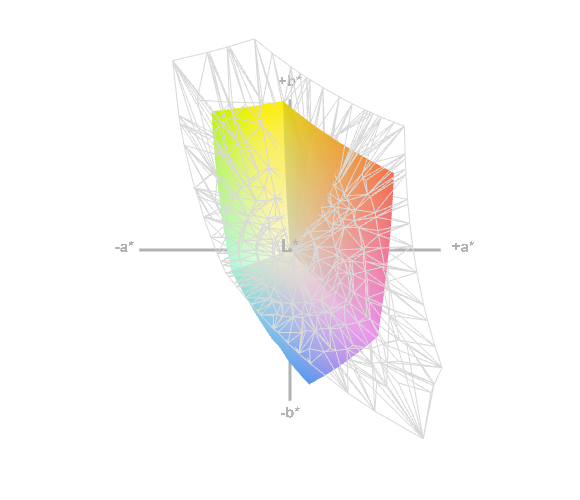 Nevertheless, going solid-state would immediately improve matters exponentially. Replacing the internal drive should be easy: simply remove the bottom panel (carefully), remove the battery and nearby cables, remove the drive assembly, and replace it with another 7 mm height model. If you’re looking to play any sort of games, you’d certainly be better served with the $899 MSRP configuration of the Edge 15, which comes with a 2 GB NVIDIA GeForce GT 840M. However, for those of us with the integrated graphics model (like our review unit), we should expect modest GPU performance at best. 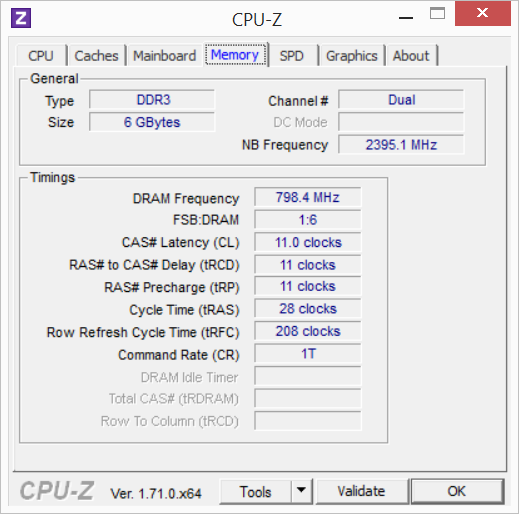 To reiterate, do bear in mind that this performance can be boosted, however, if the user chooses to replace the secondary 2 GB DDR3L SODIMM with another 4 GB stick, thus kicking the memory into dual-channel operation. 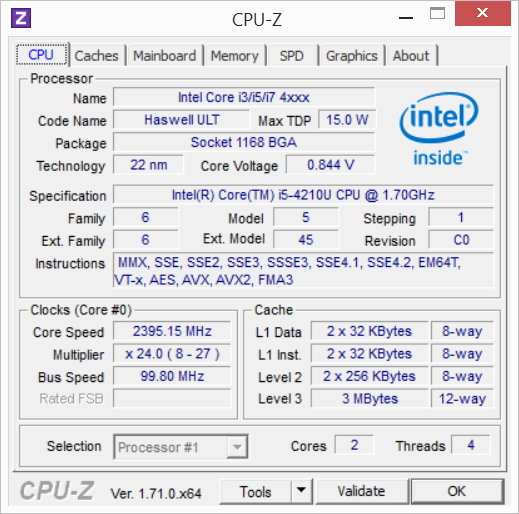 Regardless, our unit features the usual Intel HD Graphics 4400, which in the case of the Core i5-4210U is clocked at 200 – 1000 MHz. 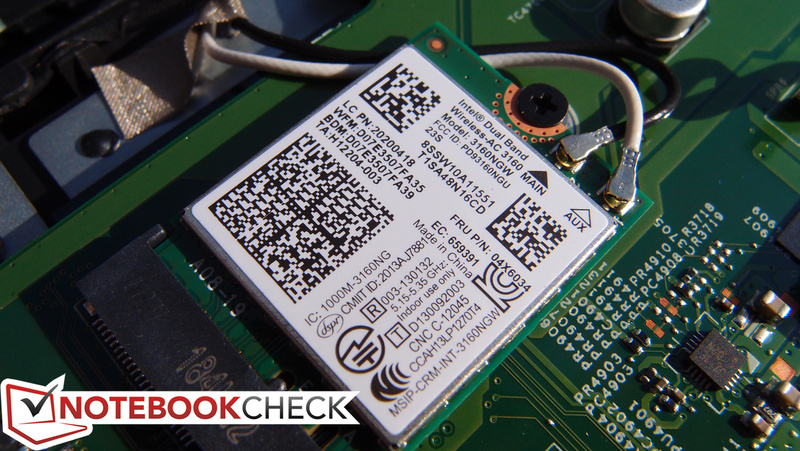 We’ve thoroughly tested this chip already, so be sure to check out our dedicated page for plenty of benchmarks. 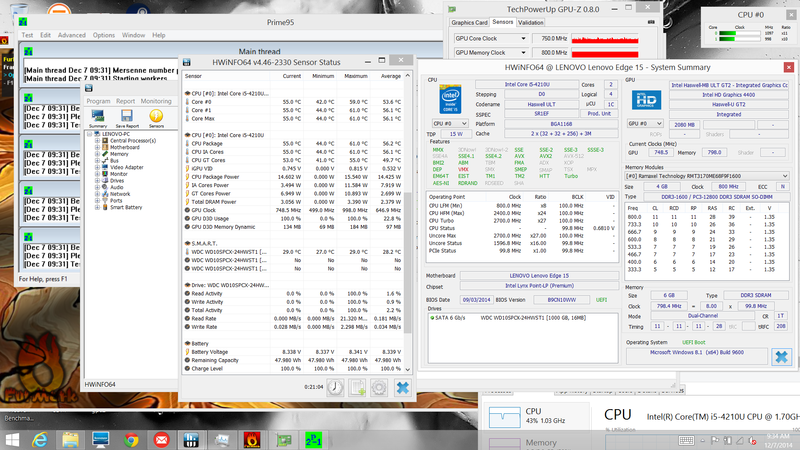 The Edge 15 certainly holds its own well enough even without the dual-channel memory, however, with scores consistently near or above the median values in our database for the GPU (e.g., 11.1 fps in Unigine Heaven 2.1, 37887 in 3DMark Ice Storm, and 21.74 in CineBench R15 64-bit OpenGL). Since its case is clearly designed for the possibility of inclusion of a discrete GPU, it should come as no surprise that the Edge 15 easily handles the lack of that GPU in the realm of peak system noise. Idle values are oddly a challenge, however; we recorded 35.3 dB(A) median, which is more due to the faint buzz of the heatsink fan than it is any sort of offensive RPM. There is a rhythmic quality to it which will likely irritate some who are more aurally sensitive—though it is also possible that this is unique to our review unit. Load values, as we mentioned, are well within tolerable parameters, however. We measured only 39.9 dB(A) max, with a median value of 37.3 dB(A). That’s noticeable, but hardly disruptive. Even with its relatively quiet operation, the Edge 15 manages to keep temperatures within bearable ranges, averaging 30.5 °C and 32.7 °C on top and bottom under load, respectively. The hottest point was the center top of the machine’s underside, which of course is situated between the legs while lapborne, keeping things comfortable for the user (the highest temperature otherwise is only 33.8 °C on the underside and 34 °C on the top, the latter of which is yet again in the center top—arguably the least critical quadrant). 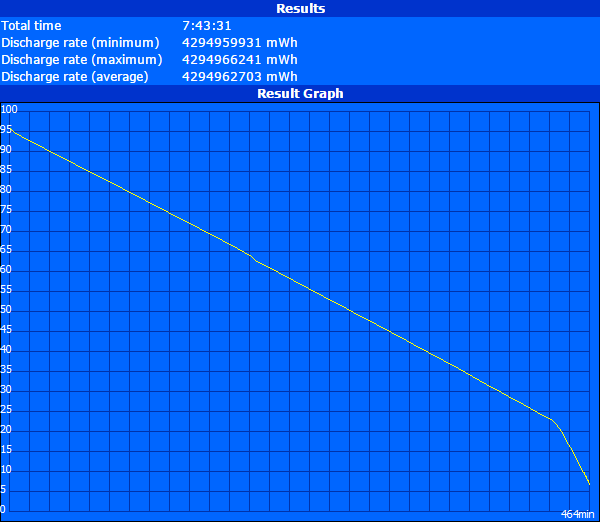 While idle, the machine barely heats up at all, with averages of just 25.6 °C and 26.9 °C in those same regions. 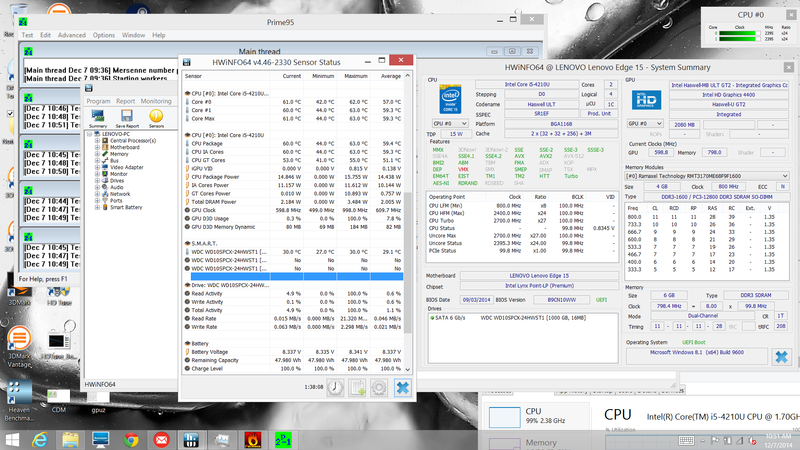 Under full CPU stress, the Edge 15 comes out a champ, with both cores consistently reaching 2395 MHz and never budging. Core temperatures never exceeded 62 °C in our testing. Meanwhile, GPU stress was handled with similar ease, though oddly, the burst clock rate hovered around an average of 750 – 950 MHz, which suggests self-imposed TDP constraints. 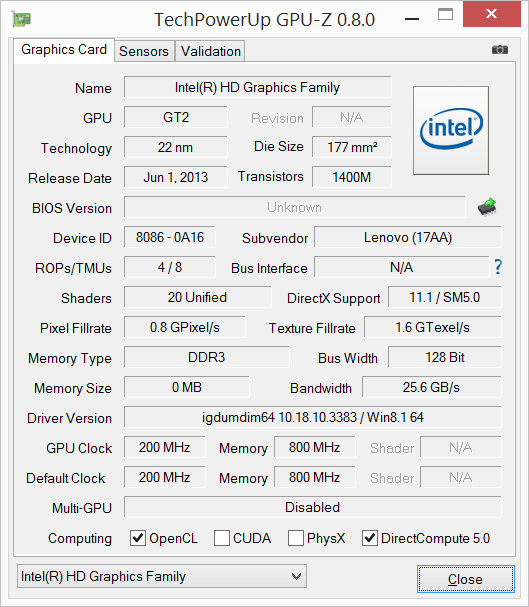 Temperatures were not an issue, with a maximum of just 55 °C recorded from GPU stress. Under a combined load of 100% CPU and GPU stress, the machine’s performance confirms our interpretations of a restrictive TDP. The GPU clock rate drops suddenly to the 550 – 650 MHz range, whereas CPU frequencies never break the 1700 MHz barrier, and eventually even throttle in blips down to 900 MHz. Yet again, temperatures seem completely unrelated, with just 58 °C reported as the maximum. The Edge 15’s bottom-mounted, down-firing speakers are certainly loud, but the shape of the sound crushes the low frequencies and seems heavy throughout the midrange, which leads to a less-than-stellar listening experience. Dolby Digital Plus post-processing software is included, but none of the adjustments we made seemed to appreciably improve matters. Again, it isn’t bad, but it’s not going to come close to a good set of external speakers or headphones. 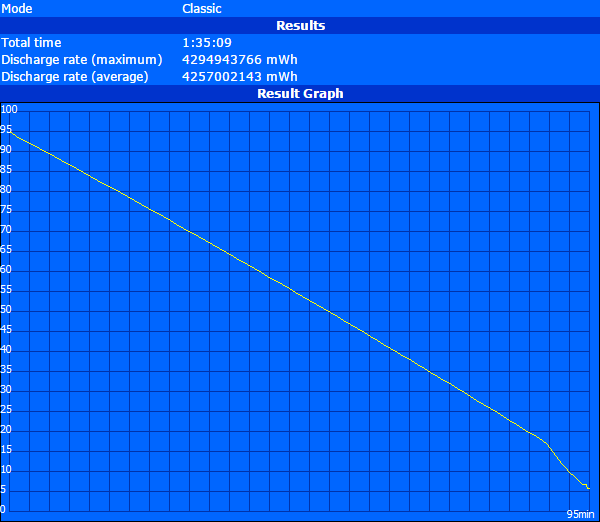 Under heavy load in the Battery Eater Pro Classic Test (with all wireless radios on, brightness at high, and High Performance power scheme), the Edge 15 lasted for 1 hour and 35 minutes. 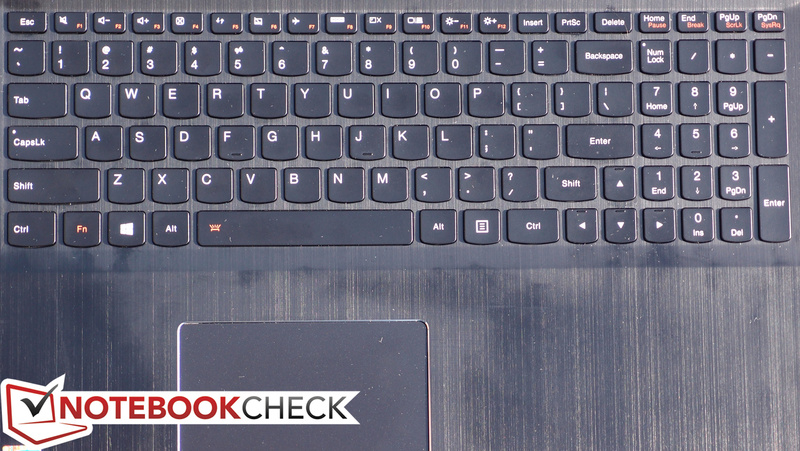 On the opposite end of the spectrum, under minimal load in the Readers Test (Airplane Mode on, brightness at minimum, and Power Saver scheme), the notebook managed 7 hours and 43 minutes. That isn’t particularly impressive, though it is worth mentioning that we could only provoke the battery to charge to 95% capacity due to firmware-based battery life management regardless of the settings before the Readers Test, so it should last just a bit longer if fully-charged. While Surfing with Wi-Fi at around 150 cd/m² brightness (setting 9/10), we recorded a rather pedestrian 6 hours and 6 minutes. However, in practical use, this is fairly good, and it should get most users through a typical day. The Edge 15 certainly is a massive improvement over the IdeaPad Flex 15 it replaces, with close-to-premium build quality and commendable rigidity alongside a sleek and understated metallic look that is universally appealing. Our review unit is also reasonably priced: just $699 for a Core i5 CPU, 6 GB of RAM, and a 1080p touchscreen (in conjunction with the aforementioned sturdy metal build). Its partial adoption of the popular Yoga 2-in-1 convertible design fused with the fundamentals of a larger, mainstream entertainment notebook seems well-intentioned and could prove useful to the right buyer (though we suspect most consumers will remain in the Laptop Mode for the vast majority of the time). The Edge 15 also does a great job of managing temperatures and is mostly quiet, even though we did notice an annoying rhythmic buzzing coming from the cooling fan on our review unit. 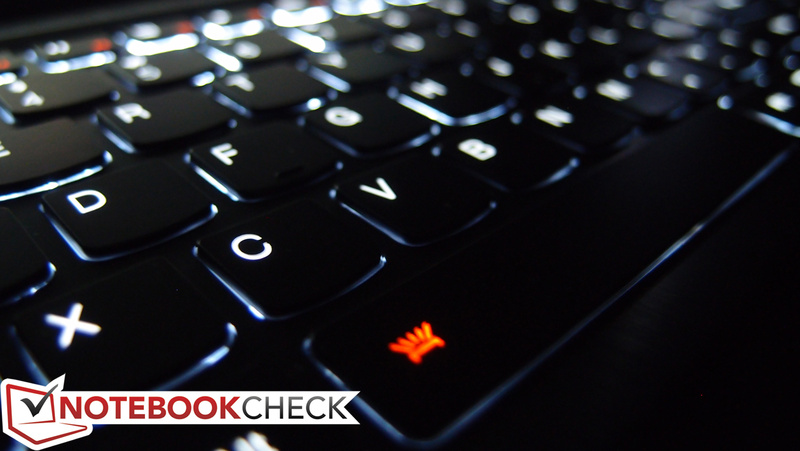 Where it stumbles, however, is firstly in the category of input devices, where a poor keyboard with short key travel, indecisive feedback, and even some sticky keys on our review unit is an unfortunate chore to use for long periods of time. The touchpad won’t win any awards either, with a comfortably large surface impeded by the usual frustrations of a middling clickpad implementation. Elsewhere, performance is also overall unimpressive, thanks primarily to the use of a 5400 RPM hard drive (albeit a rather quick and very large one) and what seems to be a quite conservative TDP limitation which constrains the GPU and combined CPU/GPU performance. Color quality and brightness from the IPS panel were disappointing to say the least, leading to a flat, washed-out appearance. We weren’t overly impressed with the shape of the audio coming from the speakers, either—too bad considering the rather large size of this notebook. As a budget alternative to a Yoga with slightly more size, however, the Edge 15 is at least a worthwhile consideration. Provided one does not plan on doing a lot of typing, isn’t concerned about vivid or accurate color, and doesn’t hang their hat on class-leading performance, it’s a pretty good value for the money—but you’ll only find it at Best Buy. 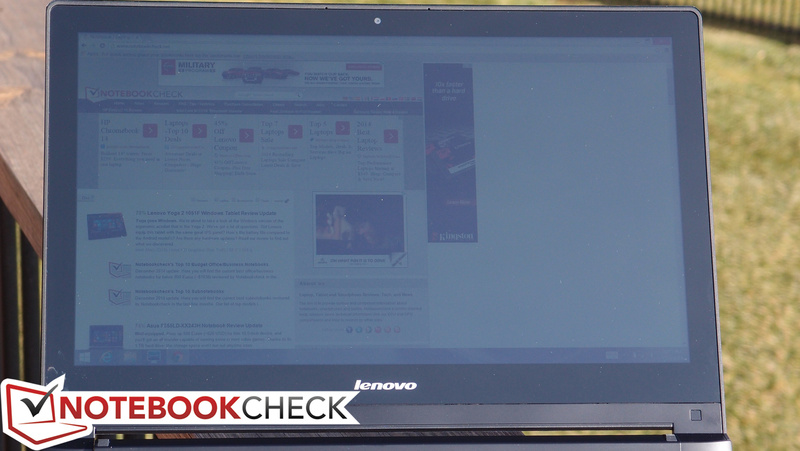 In Review: Lenovo Edge 15. 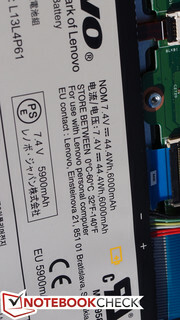 Test model provided by Lenovo US. 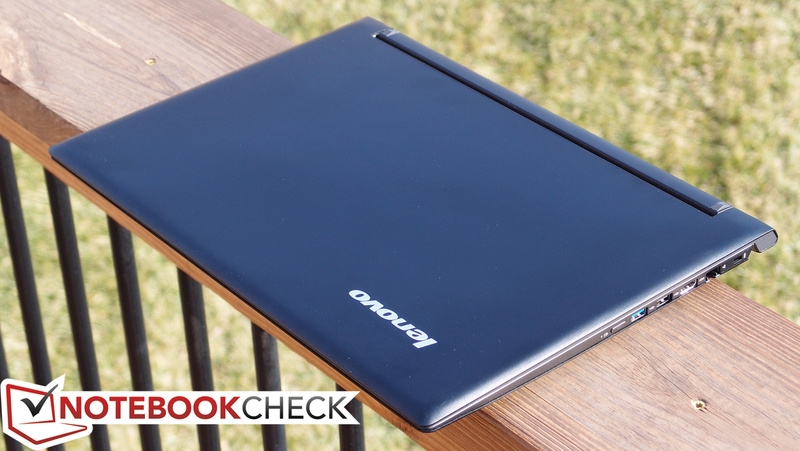 The case is quite an upgrade over that of the IdeaPad Flex series. 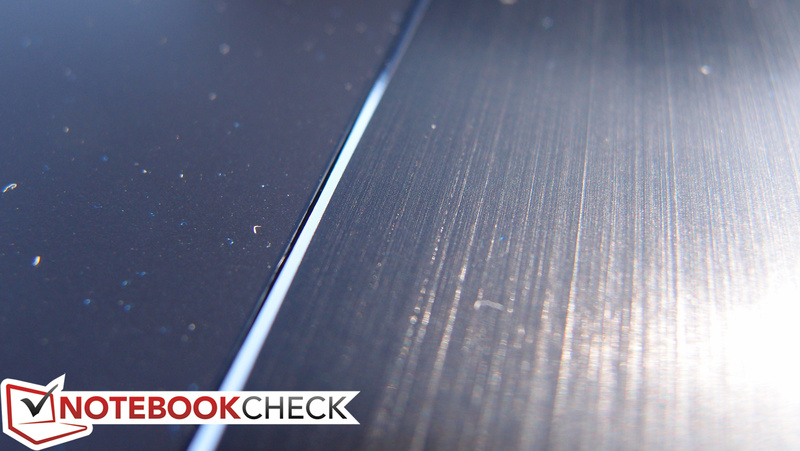 It's thin, sleek, and sturdy. 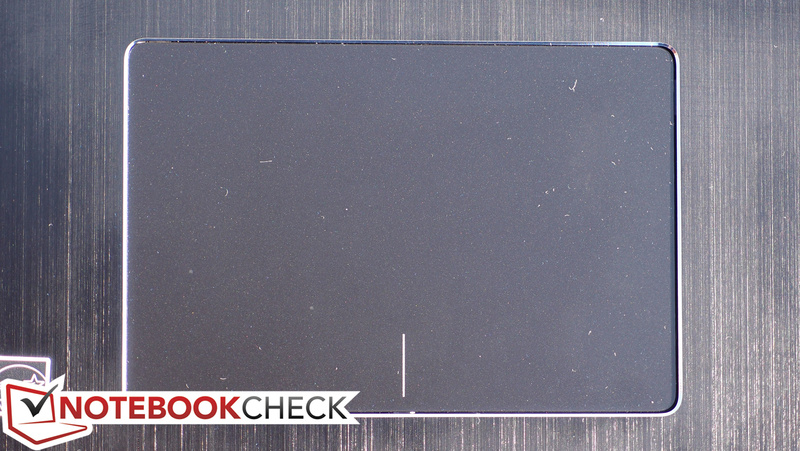 As expected, it's a high-gloss screen. The powerful hinges support the screen well. This is the only transformation supported. The keys feature very limited travel. ...all of the major components are easily serviceable. Replace the 2 GB stick with a matched 4 GB one and you'll have dual-channel performance.